Considering that over 500,000 hours of content are uploaded to YouTube on a daily basis, it can be difficult to stand out on the platform. YouTubers such as Scott Wozniak (host of the YouTube series “Scott The Woz”) have found a balanced way to stand out on the website, combining video game insights with humor in a seamless manner. In this interview, Wozniak discusses his favorite YouTube channels and how he originally began making videos. Innovation & Tech Today: What originally got you into making YouTube videos? Scott Wozniak: Well ever since I was a little kid, I always loved creating. I used to draw a lot, whether it be cartoons I watched on TV or my own creations. This evolved into me writing short stories in second and third grade when the teacher told us to write a “journal entry.” I would present my stories to the teacher/class and everybody seemed to enjoy them. This inspired me to turn my stories into videos after I received a digital camera for Christmas in 2006. I would consistently make videos for myself, burn them onto a DVD, draw my own cover art, and put them on my shelf. I started my own weekly magazine with comics, news, and games for my classmates while also running a website to host the magazines. In addition to putting the videos I made on YouTube, I was fundamentally creating a media empire for like 20 of my classmates to see. I heavily got into video production around this time as it was a ton of fun for me to create something from start to finish and put it on YouTube for the world to see – or for around 50 viewers at the time. Over time, I slowed down on making my magazine, running the website, and creating YouTube videos, until I fully stopped production around 2011-2012. I just wasn’t seeing viewership that encouraged me to continue creating. I still made videos from time to time, mostly school projects, and still had a passion for it though. I&T Today: What are some of the biggest benefits and challenges to working with YouTube? Scott Wozniak: Working on YouTube can be super cool but also one of the most stressful jobs out there. It’s great having an audience, no matter the size. Having people who want to watch your content is such a fantastic feeling; it makes you feel like, “Hey! I must be doing something right!” However, YouTube can be crazy stressful. Most of the time, you’re the only one working on a video; it’s not like most other jobs where you just show up, do the work, and leave. It’s much harder to have to be creative for work rather than just doing an assigned task. Video production also isn’t the quickest thing in the world; it can be incredibly time consuming. But in the end, it is wildly satisfying to pour your heart into a project and see thousands enjoy it. I&T Today: Your videos definitely show your dry sense of humor. What are your major influences in terms of comedy? Scott Wozniak: Ha! I wouldn’t say it’s completely dry; it’s a mix of lots of different styles of humor I suppose. There is a lot of sarcasm, absurdism, and even more than that, it’s just that I don’t really like to think of what exactly my humor is. In my opinion, when you analyze a joke, it becomes unfunny, so I don’t like to overthink what my humor is all about. If something makes me laugh, I’ll throw it in the script. I&T Today: Which of your fellow YouTubers are you most fond of? Scott Wozniak: Lots! Just a few examples would be SomecallmeJohnny, Storm Dain Productions, Game Sack, Internet Comment Etiquette, RelaxAlax. Those are just a few I spotted in my subscriptions. I&T Today: The fantastic game Madden 08 makes a number of appearances on your channel. Where did this originally start? Scott Wozniak: I found a copy of Madden 08 on the Xbox 360 for a dollar in 2013. Then I found a copy for the PC a few months later for a dollar. Every time I saw a copy of Madden 08 for another system, I picked it up. I&T Today: In addition to games, you’ve also done more unconventional videos examining topics such as Tinder and smoking. Do you plan on doing more of those in the future? Scott Wozniak: Ah! Those are the “special” episodes of “Scott The Woz” that have absolutely nothing to do with video games! I recently released one to coincide with Tax Day entitled “Get Rich Quick!” Those are some of my favorite things to make! I love talking video games, but there’s something special about making something completely original so I’ll always make new episodes like that! 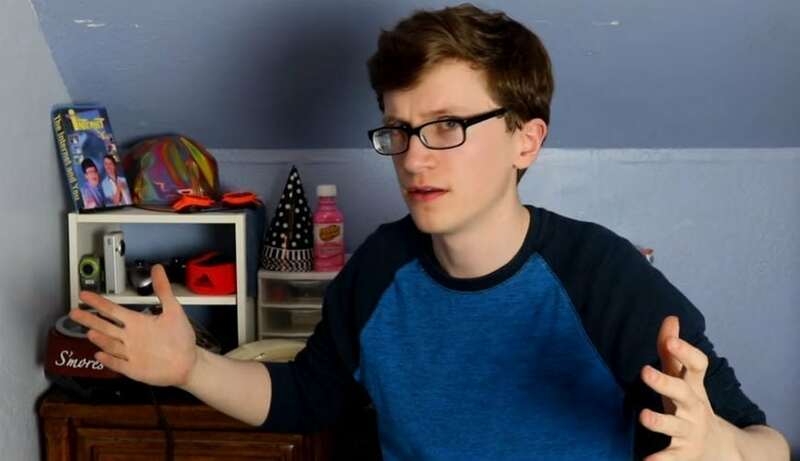 In terms of non-“Scott The Woz” videos, those are also always in the pipeline, it’s just they aren’t on a schedule, so it’s a bit random and infrequent when they pop up. I&T Today: How do you see your channel growing in the future? Scott Wozniak: Well, I still plan to do weekly episodes of “Scott The Woz.” Hopefully, I can do more original content in the future. I’d love to make a pilot for a show or make more short films!